Interview with Jeryuan (November 23rd 2006). This interview was conducted through telephone by KillBill. This is my first post by VolariGamers and I hope u don’t laugh about me and my English! I try my best but … German is a so much better language!?! Ok here is my question: I have buy my first XGI Graphic card and I’m very curious on it! 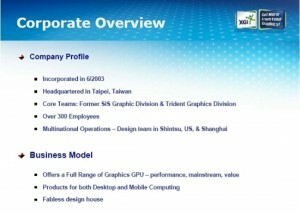 XGI Technology, a graphics processors designer based in Taipei, Taiwan, showcased at CeBIT 2005 its upcoming cards such as the Volari 8300, known under its code-name XG47, designed for value and mobile applications. Since XGI launched its own branded graphics processors in last year September, XGI has established a well structured distribution plans in just six months. Major well-known partners in various regions included ASK Corporation in Japan, EagleTEC Trading in Europe, D&H Distribution and ASI Corporation in US. 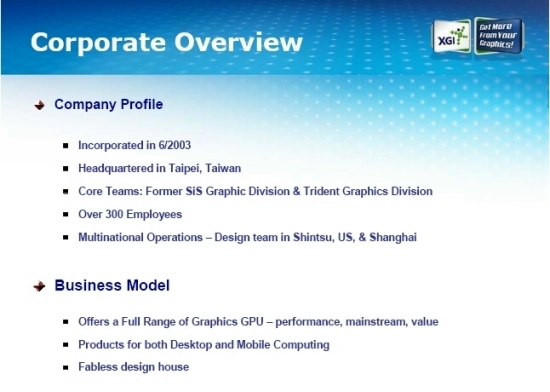 Furthermore, XGI’s graphics chips have already been adopted by manufacturers such as Dell, ECS, Chaintech, Club 3D and Link King Electronics Ltd.